Along with map and display capabilities, ArcGIS Online comes equipped with the ability to conduct geo-processing tasks, or geoservices. Esri currently provides geocoding and network analysis geoservices, among others. Users with an ArcGIS for Server instance can also publish their own geoservices and models from the Esri software suite and consume them via ArcGIS Online. This means that customized workflows can be distributed via ArcGIS Online for consumption by non-technical users in the field. These services can be also be integrated into custom interfaces developed using the ArcGIS Web Mapping API’s or the ArcGIS Mobile Runtime SDK. 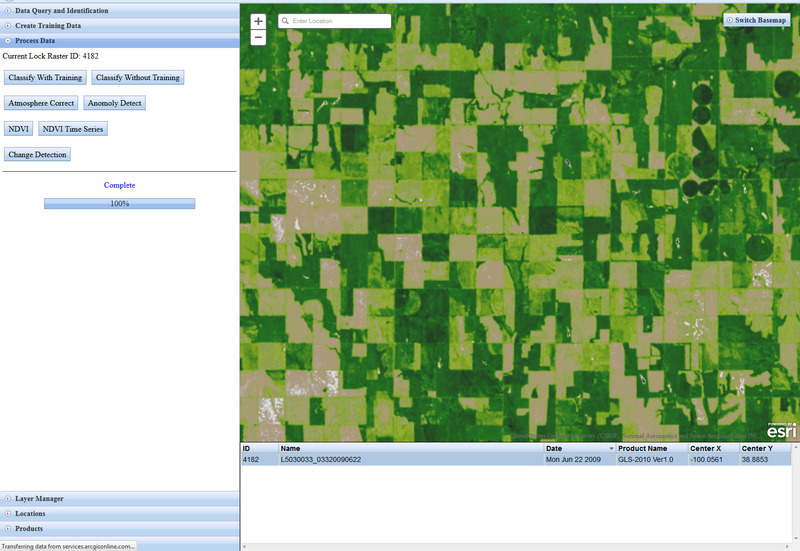 This example of ENVI image analysis being run on image service data from the ArcGIS online environment is a snapshot of the future. In the same way that the storing and viewing of map products has migrated to the internet, so too will the analysis of large data be executed on large servers in remote locations and consumed via thin clients and mobile apps. What do you think? Are thin clients such as ArcGIS Online that consuming remote data and analysis functionality the future of GIS? Do you see a need in your organization for web-deployed analytics? ArcGIS Online Will Change How You Think about Mapping and GIS, Esri 2012.